The origins of the Japanese people is not entirely clear yet. It is common for Japanese people to think that Japan is not part of Asia since it is an island, cut off from the continent. This tells a lot about how they see themselves in relation to their neighbours. But in spite of what the Japanese may think of themselves, they do not have extraterrestrial origins, and are indeed related to several peoples in Asia. We shall have to go back a long way through history and analyse in depth the genetics, culture and language of the archipelago and try to find out whether the Japanese are indeed unique, and in what way. During the last Ice Age, which ended approximately 15,000 years ago, Japan was connected to the continent through several land bridges, notably one linking the Ryukyu Islands to Taiwan and Kyushu, one linking Kyushu to the Korean peninsula, and another one connecting Hokkaido to Sakhalin and the Siberian mainland. In fact, the Philippines and Indonesia were also connected to the Asian mainland. This allowed migrations from China and Austronesia towards Japan, about 35,000 years ago. These were the ancestors of the modern Ryukyuans (Okinawans), and the first inhabitants of all Japan. The Ainu came from Siberia and settled in Hokkaido and Honshu some 15,000 years ago, just before the water levels started rising again. Nowadays the Ryukuyans, the Ainus and the Japanese are considered three ethnically separate groups. We will see why. It is now believed that the modern Japanese descend mostly from the interbreeding of the Jōmon Era people (15,000-500 BCE), composed of the above Ice Age settlers, and a later arrival from China and/or Korea. Around 500 BCE, the Yayoi people crossed the see from Korea to Kyushu, bringing with them a brand new culture, based on wet rice cultivation and horses. As we will see below, DNA tests have confirmed the likelihood of this hypothesis. About 54% of paternal lineages and 66% the maternal lineages have been identified as being of Sino-Korean origin. Evidence has emerged from ancient DNA testing that there may have been two major waves of migration from the continent to Japan. The Iron Age Yayoi invasion from Korea was only the most recent of them. Kenichi Shinoda (2003) found Chinese-looking maternal lineages (haplogroups A, B, F, M8a and M10) in the Kanto region dating from the late Jōmon period mixed with typical Jōmon lineages (M7a, N9b). 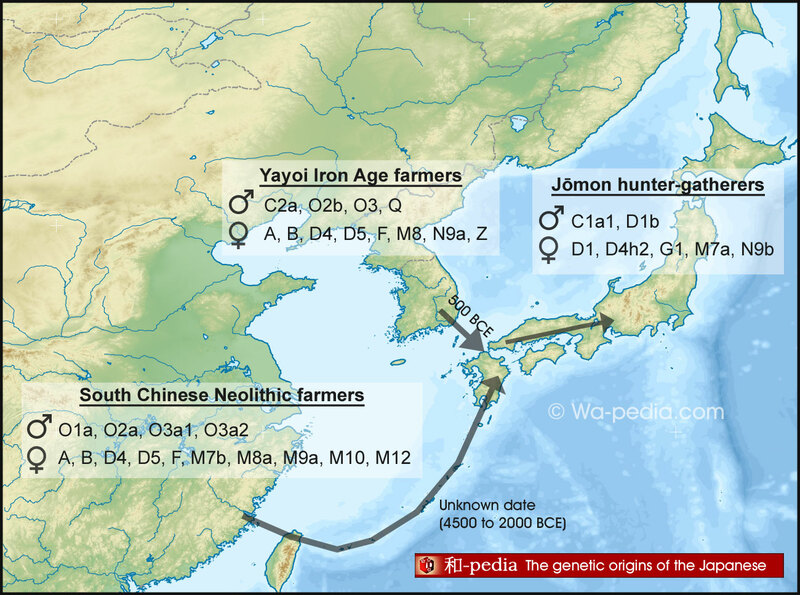 Although this hasn't been completely confirmed yet, this could indicate that farmers from mainland China colonised Japan several millennia before the Yayoi invasion, which would explain why the Japanese also possess typically South Chinese Y-haplogroups not found in Korea, such as O1a, O2a, O3a1c (JST002611) and O3a2 (P201). Two kinds of DNA tests allow to trace back prehistoric ancestry. The first one is mitochondrial DNA (mtDNA), DNA found outside the cells' nucleus and inherited through the mother's line. The other is the Y-chromosome (Y-DNA), inherited exclusively from father to son (women do not have it). They are both inherited in an unaltered fashion for many generations, which allow geneticists to identify very old lineages and ancient ethnicities. Y-DNA data: Ainus from Tajima (2004) and Hammer (2006); Han Chinese from Katoh (2004), Karafet (2005), Xue (2006), Kim (2011) and Trejaut (2014); Koreans from Shin (2001), Xue (2006) and Kim (2011); Japanese from Katoh (2004), Hammer (2006), Nonaka (2007), Poznik (2016) and FTDNA (2016); Manchus from Katoh (2004), Xue (2006) and Kim (2011); Mongols from Katoh (2004), Xue (2006), Kim (2011) and Malyarchuk (2016); Ryukyuans from Hammer (2006) and Nonaka (2007); Taiwan Aborigines from Trejaut (2014). Haplogroup C is another extremely old lineage that left Africa approximately 60,000 years ago and spread over most of Eurasia. Two subclades of C are found in Japan: C1a1 (aka C-M8, formerly C1) and C2a (aka C-M93, formerly C3). Both are likely to have been in the Japanese archipelago since the first human beings reached the region 35,000 years ago. Haplogroup C1a seems to have split around 45,000 years ago in the middle of Eurasia, one group going west to Europe, and the other east to Japan. C1a2 was found among the first Palaeolithic Europeans (Cro-Magnons) during the Aurignacian period, and was still relatively common 7,000 years ago, both among Mesolithic West Europeans and Neolithic farmers from Anatolia. C1a2 is now nearly extinct in Europe. C1a1 is particularly common in Okinawa (7%), Shikoku (10%) and Tohoku (10%), but is apparently absent from Hokkaido and Kyushu. Haplogroup C2a, representing also 3% of the population, is typically found among the Mongols, Manchus, Koreans and Siberians, which suggest a propagation by the Yayoi farmers. The last surviving tribes of 'pure' Ainu people, living on the island of Sakhalin in Russia, just north of Hokkaido, possess 15% of C2a (the remaining 85% being D1b). There is therefore a good chance that C2a could also have come to Japan from Siberia through Sakhalin and Hokkaido. C2a is indeed found at both extremities of the country, peaking in Kyushu (8%), Hokkaido (5%), but is rare in central Japan, which supports the theory of two separate points of entry. Over 40% of Japanese men belong to haplogroup D, a paternal lineage thought to have originated in East Africa some 50,000 to 60,000 years ago. Its first carriers would have migrated along the coasts of the Indian Ocean, from the Arabian peninsula all the way to Indonesia, then following the chain of islands up through the Philippines and using the land bridge from Taiwan through the present-day Ryukyu islands to Japan. Korea and Sakhalin would have been connected to Japan during the Ice Age, allowing D tribes to continue their migration to eastern Siberia, Mongolia, northwest China, and ultimately ending up in Tibet. Nowadays haplogroup D only survives scattered in very specific regions of Asia: the Andaman Islands (between India and Myanmar), Indonesia (only a small minority), Southwest China, Mongolia (also a small minority) and Tibet. Haplogroup D1b (aka D-M55 or D-M64.1, formerly known as D2) is 23,000 years old and would have arrived in Japan around the time of the Last Glacial Maximum (c. 24,500 to 17,500 years before present), when a land bridge connected northern Japan to Siberia. D1b is found almost exclusively in Japan, with a small minority in places who have had historical ties with Japan, such as Korea. D1b is most common in Hokkaido (60-65%), followed by Tohoku and Kanto (40-50%) and its frequency declines as one moves towards western Japan (25-30% in Kyushu, Chugoku and Shikoku), which have higher percentages of Y-haplogroup O. Okinawans also have high levels of D1b (45%). If D1b colonised Japan from the north, it would explain why its frequency is highest in northern Japan and, conversely also why pre-LGM lineages like C1a1 survived better in southern Japan, notably Okinawa and Shikoku. The only other variety of D identified among the Japanese is D1a1 (D-M15), which only makes up 0.5% of the Japanese male population. This haplogroup is particularly common among some ethnic groups from Southwest China and Indochina, such as the Hmong and Ksingmul in Laos, the Qiang in Sichuan, and the Yao people in Guanxi and Vietnam. Tibetans carry about 54% of haplogroup D, including 15.5% of D1a1 and 30% of D1a2a (P47). D1a1 might have come to Japan with Neolithic farmers from southern China (see box below). Andaman Islanders belong to the basal D*. It means that their most recent common ancestors goes back tens of thousands of years. In other words the genetic gap between these ethnic groups is immense, despite false appearances of belonging to a common haplogroup. Haplogroup D1b was formed 45,000 years ago, but the most recent common ancestor of Japanese D1b members lived 23,000 years ago, which means that other D1b branches may have become extinct outside Japan. Haplogroup D1b is found among the Ryukyuans as well as the Ainus, and is thought to have been the dominant paternal lineage of the Jōmon people. Almost exactly half of Japanese men belong to haplogroup O, a paternal lineage of Paleolithic Sino-Korean origin that is now found all over East and Southeast Asia. Haplogroup O2b (aka O-SRY465) is found especially in Manchuria, Korea and Japan, and very probably came to Japan with the Yayoi people. It reaches its highest frequency in western Japan (35%) and is least common in Hokkaido (12.5%) and Okinawa (22%). In the rest of the country its frequency is around 30%. Approximately two thirds of the Japanese O2b belong to the O2b1 subclade, which is much less common in Korea and Manchuria, possibly due to a founder effect among the Yayoi invaders. Haplogroup O3 (aka O-M122) is the main Han Chinese paternal lineage. It is an extremely diverse lineage, with numerous subclades, including many associated with the expansion of agriculture from northern China. Most of them are found in Korea and would have been part of the Yayoi migration to Japan. However, some specific subclades, notably O3a1c (JST002611) and O3a2 (P201) are considerably more common in southern China and among non-aboriginal Taiwanese (25%) than in Korea (6%). Within Japan, it reaches a maximum frequency in Okinawa (16%), a region with low Yayoi ancestry. Its frequency among non-Okinawan Japanese is of 10-15%, about twice higher than in Korea, a fact that cannot be explained by the Yayoi invasion. O3a1c and O3a2 could have come to Japan during the Jomon period with Neolithic farmers from southern China associated with the Austronesian expansion via Taiwan (see below). The most common O3 subclade in Korea is O3a2c1 (M134, formerly known as O3e), which is found in 25-30% of the population. In Japan, its frequency ranges from 7.5% to 10%, except in Okinawa and Hokkaido where it is only 5%. A negligible percentage of the Japanese belong to haplogroup O1a (aka O-M119), a lineage especially common in southern China, Taiwan, the Philippines, Malaysia and Indonesia, and haplogroup O2a1 (aka O-M95), which is found in south-west China, Indochina, around Malaysia and in central-eastern India. Both of them might have also have come with South Chinese Neolithic farmers during the Jomon period. Approximately 3% of Japanese men belong to haplogroup N, a lineage that is thought to have originated in China some 35,000 years ago, but underwent a serious population bottleneck during the Last Glacial Maximum, and re-expanded after that. Japanese people belong to N1, a subclade that is associated with the diffusion of the Neolithic lifestyle from northern China to Siberia. Haplogroup N1 was found at high frequency (26 out of 70 samples, or 37%) in Neolithic and Bronze Age remains (4500-700 BCE) from the West Liao River valley in Northeast China (Manchuria) by Yinqiu Cui et al. (2013). Among the Neolithic samples, haplogroup N1 represented two thirds of the samples from the Hongshan culture (4700-2900 BCE) and all the samples from the Xiaoheyan culture (3000-2200 BCE). Haplogroup N1c is found especially among Uralic and Turkic peoples nowadays, including among the Finns, Estonians and Sami in Northeast Europe, and among the Turks in Central Asia and Turkey. It is found at low frequencies in Korea and could have arrived with the Yayoi people. Alternatively, N1 could also have entered Japan via Sakhalin and Hokkaido, as it is present among eastern Siberia tribes. Haplogroup Q is the dominant lineage of Native Americans, but originated in Siberia. Nowadays it is found at varying, but generally low frequencies throughout Siberia, Central Asia, as well as parts of the Middle East and Europe. While haplogroup N1 seems to have propagated from northern China to Siberia, haplogroup Q would have spread the other way round, apparently only reaching northern China and Korea some 3,000 years ago with invasions from Mongolia. As this was before the Yayoi invasion of Japan, it is possible that the tiny fraction of Japanese Q lineages came with Yayoi farmers. It is unlikely to have entered Japan through Hokkaido as it is not found among tribes at the eastern extremity of Siberia, nor among the Ainus. In conclusion, approximately 44% to 48% of modern Japanese men carry a Y-chromosome of Paleolithic Jōmon origin. The highest proportions of Y-DNA haplogroup C and D is found in northern Japan (over 60%) and the lowest in Western Japan (25%). This is concordant with the history of Japan, the Yayoi people of Sino-Korean origins having settled first and most heavily in Kyushu and Chūgoku, in Western Japan. The matrilineal (mtDNA) landscape is more varied. There some 15 main lineages (>1%) and many more subclades or minor haplogroups. At present, 131 Jōmon-period skeletons have been tested in several separate studies, with samples from Kanto (n=54), Tohoku (n=23) and Hokkaido (n=54). The haplogroups identified in Tohoku and Hokkaido were D4h2, M7a and N9b, with also D1a and G1 in Hokkaido. Haplogroup N9b was clearly dominant in northern Japan during the Jōmon period, making up over 60% of the matrilineal lineages. Today, N9b is also found among the Udege people of eastern Siberia, just north of the islands of Hokkaido and Sakhalin. Haplogroup G1 is a typically Siberian lineage, completely absent from China, and found only at low frequencies in Korea (2.5%). It most common in eastern Siberia, particularly among the Negidals in the Khabarovsk Krai, among the Chuvans of Chukotka, where it exceeds 25% of the female lineages, and among the Itelmens and the Koryaks of the Kamchatka Peninsula, who have over 50% of G1 lineages. G1 has a frequency of 2.5% in Japan, but 22% among the Ainu, who have intermarried over the centuries with tribes from eastern Siberia via Sakhalin and the Kuril Islands. It is therefore not surprising to find in in ancient Hokkaido as well as among modern Ainu. Haplogroup D4h seems to be native to Japan, while D1 is not normally found among East Asians but among Native Americans. How did D1 end up in Palaeolithic Hokkaido is still unknown. D1 might first appeared in Siberia then migrated to the Americas, and that a few women carrying these lineages married into other Siberian tribes that eventually came into contact with the Ainu, after many generations of geographic drift. It should be said, however, that D1 now extremely rare in the modern Japanese population and may even have become extinct since the Jōmon period. Samples from Kantō were more varied and suggests that migrations from the continent might have happened before the Yayoi period. They included haplogroups A (7.4%), B (9.3%), D4h (18.5%), F (1.9%), G2 (1.9%), M7a (3.7%), M7b (1.9%), M8a (9.3%), M10 (33%) and N9b (5.6%). Like N9b, haplogroups M7 and M10 are extremely ancient lineages that are associated with the some of the earliest migrations of Homo sapiens to East Asia over 50,000 years ago. M7b, M7c and M7e have been found in southern China, Indochina, and the Philippines. M7a, M7b and M7c were all found during the Jōmon period and are still found in modern Japan. However, about 60% of Japanese M7 members belong to M7a, which is really specific to Japan. M10 is considerably more common in China and Korea than in Japan. Haplogroup G2 is found in 5% of the Japanese population, but only 4% of the Ainu. It has a very different geographic distribution, being absent from eastern Siberia, but relatively common in Korea (6%), northern China (6.5%), Mongolia (10%), Tibet (11%), Nepal (14%) and even Central Asia. 78 mtDNA samples from the ancient Yayoi people have been tested to date. Half of them belonged to haplogroup D4, while 15% belonged to haplogroup A and another 15% to haplogroup B. The remaining samples were made up of haplogroups F, M8, N9a and Z. The presence of haplogroup Z is particularly interesting as it is a typically Siberian lineage, also found among the Uralic populations of Northeast Europe, including the Sami of northern Fennoscandia. Uralic speakers share the patrilineal haplogroup N1c which seems to have originated with Neolithic farmers or herders from Manchuria (=> see Y-DNA section above). Modern Japanese possess about 1.5% of mtDNA Z and Y-DNA N, which could both represent ancestry from those Manchurian Neolithic farmers. Haplogroup M9a is found in 2% of the Japanese population. It the most common lineage that still hasn't been found in either Yayoi or Jōmon samples. Nowadays M9 is found in Korea, China and Tibet. 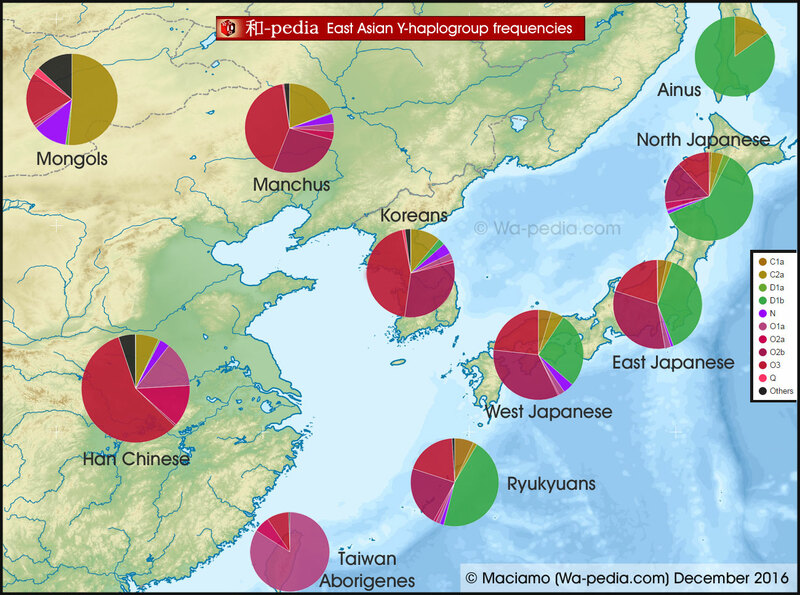 The much rarer haplogroup M12 only makes up 0.1% of the Japanese population, and is found especially on the Chinese island of Hainan, but also at low frequencies in mainland China and Korea. The equally rare M13 (0.2%) is found chiefly among the Mongols, Tibetans and some Siberian ethnic groups like the Yakuts and Dolgans. Haplogroups C (C1, C4a, C5) and Y are North Asian lineages with frequencies of respectively 0.35% and 0.40% in Japan. Haplogroup C is common of Siberia and Mongolia and is otherwise rare in East Asia. It is still unclear when it arrived in Japan. Haplogroup Y is found at the western and eastern ends of Siberia. Although very rare in Japan, it is considerably more common among the Ainu (about 20%), both inside and outside Japan. It hasn't been found so far in either Jōmon or Yayoi samples. The Ainu would have acquired these haplogroups through population exchange (intermarriages, probably) with their Siberian neighbours. This could also explain how Y-DNA haplogroup C3 and N, two paternal lineages typical of Mongolia and eastern Siberia, permeated the Ainu stock. Another interesting discovery is the 0.5% of haplogroup HV identified among the modern Japanese. HV is a very old lineage (40,000 years old) typical of the Middle East, with frequencies progressively fading as one advances through Europe, Central Asia and Siberia. Haplogroup HV may have been brought by Neolithic farmers or Bronze Age Proto-Indo-European speakers from the Pontic-Caspian Steppe to Siberia and Mongolia. Its negligible presence in Korea and Japan could be explained by the fact that these two populations intermingled a bit with from Bronze Age Mongols, from whom they acquired horses and bronze working. To this day, the Mongols have between 10 and 15% of European or Middle Eastern DNA inherited from Neolithic farmers and Bronze Age Indo-Europeans. The Koreans and Japanese only have traces of European DNA (about 0.1%), but it is present. Did South Chinese Neolithic farmers colonise Japan during the Jōmon period? It is not clear at present why typically Chinese mtDNA haplogroups like A, B, F, M8a and M10 were already present in the Kanto during the Late Jōmon period (1500–300 BCE). These may represent early migration of farmers from the continent, many centuries or millennia before the Yayoi invasion. Catherine D'Andrea reported evidence for Late Jōmon rice, foxtail millet, and broomcorn millet dating to the first millennium BCE in Tohoku. However, there is evidence of plant cultivation in Japan long before that. Arboriculture was practiced by Jōmon people in the form of tending groves of nut- and lacquer-producing trees (see Matsui and Kanehara 2006 and Transitions to Agriculture in Japan, Gary W. Crawford). A domesticated variety of peach, apparently from China, appeared very early at Jōmon sites circa 4700–4400 BCE. Several sites (including Torihama, Sannai Maruyama and Mawaki in central and northern Honshu) of the Early Jōmon (4,000–2500 BCE) and Middle Jōmon (2500–1500 BCE) periods show evidence of cultivated plants, including barley, barnyard millet, buckwheat, rice, bean, soybean, burdock, hemp, egoma and shiso mint, mountain potato, taro potato, and bottle gourd. Many archeologists believe that these cultivated plants were only used to supplement the Jōmon diet, which still relied heavily on hunting, fishing and gathering. Most of these domesticated plants, including rice and millet, are very unlikely to have been domesticated independently by the Jōmon hunter-gatherers, and almost certainly required the migration of farmers from China or Korea. The hundreds of ancient DNA samples from the Middle East and Europe have confirmed that the spread of agriculture always involved the migration of farmers and did not propagate purely by cultural diffusion. Consequently, it is extremely likely that Chinese Neolithic farmers brought these crops to Japan, perhaps in several waves of migration which would have taken place between 4500 and 2500 BCE. The presence of typically South Chinese paternal (D1a1, O1a, O2a, O3a1, O3a2) and maternal lineages (M7b, M7c, M9, M12) strongly suggests that at least one of these Neolithic migrations originated in South China. These specifically South Chinese haplogroups represent approximately 5-10% of the modern Japanese maternal lineages and up to 15% of paternal ones. However, South Chinese farmers would have also carried haplogroups shared by the Yayoi people, such as other Y-DNA O3 subclades, and mtDNA A, B D4, D5 and F. Late Jomon mtDNA samples from the Kanto region shows that Chinese lineages made up about 65 to 75% of the maternal lineages at the time. A fairer approximation of the share of modern lineage of Neolithic South Chinese origin might be anywhere between 5 and 35% for maternal lineages, and perhaps around 10 to 20% for paternal ones. More data would be needed to give a more accurate estimation. It remains to be confirmed how South Chinese Neolithic farmers reached Japan, but the easiest and safest route is via Taiwan and the Ryukyu Islands. Agriculture appears to have taken root in Taiwan between 4000 and 3500 BCE. The The southern Ryukyu Islands were re-settled by around 2300 BCE as part of the Neolithic Austronesian expansion from Taiwan (Austronesian and Jōmon identities in the Neolithic of the Ryukyu Islands, Mark J. Hudson (2012)), and could have reached Kyushu by 2000 BCE. However, this does not account for the evidence of crops during the Early Jōmon period, which might have come through another route, either following the coastline until the Korean peninsula, or crossing directly from China to Kyushu. A third possibility is that the first migration from Southeast China followed the chain of islands from Taiwan to Kyushu without stopping along the way and only settling in Japan itself, while Taiwan and the Ryukyus were settled by another later migration from mainland China. In fact, these Austrnesian Neolithic farmers reached the Philippines by 5000 BCE and the rest of Southeast Asia by 4000 BCE, so there is no reason they couldn't have reached Japan by then. There is reliable evidence of a minor but very real linguistic connection between Austronesian languages (notably Malay) and Japanese (see Linguistic evidence below), and the Austronesian expansion from south-eastern China is the best way to explain it. Genome-wide SNP genotypes of the Japanese show that people from northern Japan (Tohoku and Hokkaido) are the most distantly related to the Han Chinese, while those from Western Japan (Kyushu, Chūgoku, Kinki) are the closest. This confirms the theory of the continental Yayoi invasion from Kyushu. Okinawan people were shown to be a clearly distinct ethnic group, falling in a separate genetic cluster from other Japanese. Japanese and Korean languages are both classified by linguists as relatives of Altaic languages, which includes Mongolic, Tungusic and Turkic, among others. Nevertheless, Japanese is so distant from Mongolic and Turkic than the similarities are hardly more evident than those with Indonesian. Korean language, however, is much closer to Japanese. The grammar is very similar, and both have imported about half of their vocabulary from Chinese, which makes these three languages almost mutually understable in the written form, thanks to Chinese characters (rarely used in Korea nowadays, except in place names). Native Korean and Japanese words are often related when comparing Old Korean and Old Japanese, but few of them are really obvious to modern speakers. Ancient Korea was divided in three kingdoms, Baekje, Silla and Goguryeo, each with their own distinct language. Jared Diamond, a renowned UCLA anthropologist, argues in an article for Discovery Magazine that the modern Korean language is derived from that of the ancient Kingdom of Silla, the eastern Korean kingdom that unified Korea, whereas the Old Japanese spread by Yayoi farmers would be derived from the ancestral language of the northern Kingdom of Goguryeo. Mindset and values in Japan and South Korea are deeply intertwined, thanks to the strong influence of Confucianism, Taoism and Buddhism in both countries. This is obvious from the corporate culture (e.g. discipline, seniority system), the strict politeness system, or the Taoist/Buddhist value of simplicity and humility. These cultural aspects all ultimately stem from China. That's why Japan and Korea are considered branches of the Chinese civilisation. The Japanese colonisation of Korea (1895-1945) has left of a lot of resentment on the Korean side and a sense of superiority mixed with repressed shame and denial on the Japanese side. This is why both Koreans and Japanese are often reluctant to admit their similitudes. However, thanks to natural affinities in sensitivities and tastes, South Korea and Japan appear to be culturally closer as ever nowadays. A comparison of Malay (Bahasa Indonesia/Melayu) and Japanese languages reveals a few uncanny similarities. Apart from the very similar phonetics in both languages, the same hierarchical differences exist in personal pronouns. For example 'you' can be either anda or kamu in Malay, and anata and kimi in Japanese. Not only are the meaning and usage of each identical, but they also sound almost the same. Likewise, the Japanese verb suki (to like) translates suka in Malay. The chances that this is a pure coincidence is extremely low, and may reveal a common origin. Furthermore, in both languages the plural can be formed by simply doubling the word. For instance, in Japanese hito means 'person', while hitobito means 'people'. Likewise ware means 'I' or 'you', whereas wareware means 'we'. Doubling of words in Japanese is so common that there is a special character used only to mean the word is doubled (々) in written Japanese. In Malay, this way of forming the plural is almost systematic (person is orang, while people is orang-orang). Furthermore, expressions like ittekimasu, itteirashai, tadaima and okaeri, used to greet someone who leaves or enter a place, and which have no equivalent in Indo-European languages, have exact equivalents in Malay/Indonesian (selamat jalan, selamat tinggal...). One could wonder how Malay and Japanese ever came to share such basic vocabulary and grammatical features, considering that there is no known historical migration from one region to other. The Palaeolithic Jōmon people are thought to have arrived from Austronesia during the Ice Age. The original inhabitants of Indonesia and the Philippines might have been related to Dravidians of Southern India. Y-haplogroup C, which has been associated with the first migration of modern humans out of Africa towards Asia, is relatively frequent in Kerala (southern tip of India) and Borneo. These early Austronesians are thought to have been the ancestors of the Ice Age settlers of Japan (Y-haplogroups C1a1 and D1b). Nevertheless, it is doubtful that any meaningful linguistic connection remains between the Dravidians, Andamanese, Austronesians and Japanese after tens of thousands of years of separation. The common root of the two languages must be more recent, and indeed there is one migration that could explain the connection between the two groups: the Neolithic Austronesian expansion from southern China. From approximately 5,000 BCE, South Chinese farmers expanded southward to Taiwan and Southeast Asia, bringing Y-haplogroups O1, O2 and O3 to the region, which are still the dominant paternal lineages today. There is evidence of farming in Taiwan at least from 4000 BCE, but agriculturalists would probably have arrived earlier considering that the Neolithic reached the Philippines circa 5000 BCE, and Vietnam, Thailand, Malaysia and Indonesia around 4,000 BCE. As I have argued above, the same migration could have followed the Ryukyu archipelago until Kyushu, then colonised Honshu and Shikoku. In fact, there is no good reason why these seafaring farmers would travel as far as Indonesia and not to Japan, which is much closer. Many more Japanese words could be of Austronesian origin. The linguist David B. Solnit estimates that among 111 common Japanese words he analysed, 28% had Austronesian cognates only, while 40% had Altaic cognates, 23% competing cognates, and 9% no cognate in either. Considering that the various branches of Proto-Austronesian split over 6,000 or 7,000 years ago, longer than Indo-European languages, it is not surprising that even languages that are undeniably classified as Austronesian today have evolved very diverging vocabularies today (except Polynesian languages, which only started to diversify with the Polynesian expansion 2,000 years ago). It is generally more useful to look at the Proto-Autronesian root of words rather than to try to find direct matches between modern Japanese and modern Austronesian languages. For example, the Proto-Austronesian root for fish is *sikan, which gave sakana in Japanese (and maybe also ika, which means squid), ikan in Malay, ika in Fijian, and isda in Tagalog. Cases of high lexical-semantic retention over six millennia like kamu/kimi, anda/anata and suka/suki are extremely rare. The Austronesian connection with Japanese was first suggested in 1924 by the Dutch linguist Dirk van Hinloopen Labberton. Many linguists have since proposed the hypothesis that the Japonic language family evolved from an Austronesian substratum (Jōmon) onto which was added an Altaic superstratum (Yayoi). However, if Austronesian speakers came to Japan with South Chinese Neolithic agriculturalists, the original Jomon people would have spoken another language, either one of Siberian origin, in light of the mtDNA ties between Jomon and Ainu people and eastern Siberians, or a language isolate, reflecting the uniqueness of the Jomon paternal D1b lineage. Therefore, Middle and Late Jomon people would already have spoken a hybrid language. Likewise, the Koguryoic Korean language of the Yayoi people would also be a hybrid incorporating Altaic elements of Mongolian origin into an older Korean substratum of Paleosiberian origin. Since the 6th century CE, the Japanese started incorporating words from Chinese after adopting Buddhism and Chinese characters, in the same way that English absorbed a huge amount of Norman French and Latin words in the late Middle Ages. Nowadays, approximately half of the Japanese vocabulary is of Chinese origin. This explains why Japanese does not neatly fit in one or even two linguistic families, but is a hybrid of at least five separate sources: aboriginal Jomon, Austronesian, Korean, Altaic and Chinese. 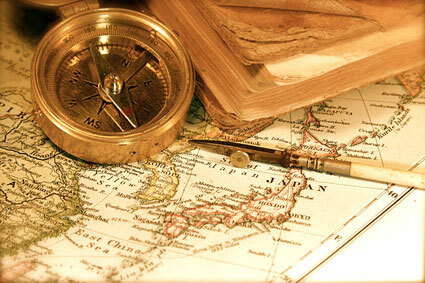 Cultural and religious similarities also exist between Japan and Austronesia. Of course nowadays most ethnic Malays and Indonesians are Muslim, but traditional religion survives in some islands, including Bali, which practices a syncretic form of Hinduism and aninism. Basically, Balinese religion is a form of Hinduism that has incorporated the aboriginal animistic religion. The parallel with Japan is obvious for people familiar with this culture. Japanese Shintoism is also a form of animism, and is practised side-by-side with Buddhism, a religion derived from Hinduism, sometimes blending the two religions in a syncretism known as Shinbutsu-shūgō. The relation between Hinduism and Buddhism is irrelevant here, and both are relatively recent imports in historical times. Before that, however, Jomon people and Neolithic Austronesians would have practised a very similar form of animism. Japanese matsuri (festivals) resemble so much Balinese ones that one could wonder if one was not copied from the other. During cremations in Bali, the dead body is carried on a portable shrine, very much in the way that the Japanese carry their mikoshi. Balinese funerals are joyful and people swinging the portable shrine in the streets and making loud noise to scare the evil spirits. There are lots of other cultural similarities between ancient cultures of Indonesia and Japan. For example, both Balinese temples and Japanese shrines, as well as traditional Japanese and Balinese houses have a wall surrounding them, originally meant tp prevent evil spririts from penetrating the property. Despite the radical changes that Indonesian culture underwent after the introduction of Islam and Christianity, and the changes that Buddhism brought to Japan, it is still possible to observe clear similarities between the supposed original prehistoric cultures of the two archipelagoes. Discuss this article at the Japan Forum.